Reunion is just one of the many ways our franchise family works together. DreamMaker® Bath and Kitchen home renovation franchise owners recently gathered for our annual Reunion, when we take the time to both celebrate the year behind us and discuss how to make our home improvement franchise opportunity even stronger next year. We call it a reunion rather than a convention because at DreamMaker, we’re all part of one big family, with a shared mission of providing excellent service to our clients. Reunion is held to celebrate everyone’s growth and success, and it also gives us a chance to recognize some of our truly outstanding franchisees and team members. With more than 30 franchises operating throughout the country, we have a deep well of best practices and industry know-how that franchisees can access to improve their business. 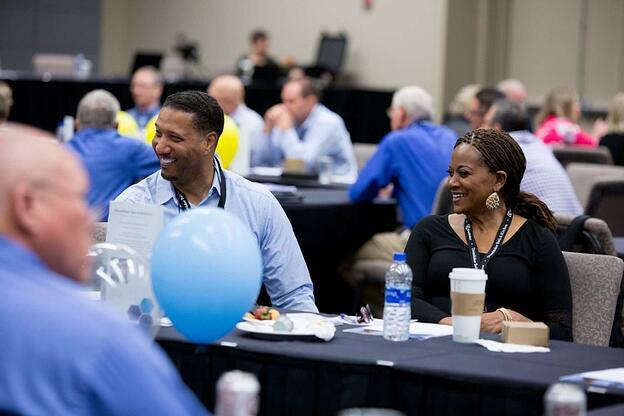 Reunion is our big celebration, but franchisees socialize, network and share frequently throughout the year. Our DreamAwards highlight the most remarkable projects over the past year that delighted clients and the hard-working franchisees and team members who created them. Our 2018 Franchise of the Year award went to Michael Pinkerton, the owner of DreamMaker of Colorado Springs. At last year’s Reunion, he received our Rookie of the Year award. 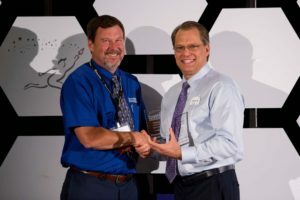 Franchisee of the Year winner Michael Pinkerton, owner of DreamMaker of Colorado Springs, with DreamMaker President and Chief Stewarding Officer Doug Dwyer. To learn more about the DreamMaker franchise opportunity, download our remodeling franchise information report. You can also visit our research pages to learn more about our home improvement franchise.